Why is California ranked 41st in per student funding? | What's that you said? Food for thought. Why does California spend so little per student? Proposition 13 is of course one factor (and it could easily be ameliorated by disallowing commercial property to take advantage of Prop 13 and apply it only to residential properties). But while it clearly helps stabilize things for the homeowner, t he loss in revenue — because property taxes are used locally to finance public education — has to be made up in other ways, and California has never done that. Perhaps that accounting has now come due. If you are going to ratchet down property taxes, you’ll have to account for what they used to pay. I myself would be delighted to see the state set a per student per day rate that is the same across the entire state. So that schools in poor areas are not penalized by the lower property taxes. While money has been shown not to be the only factor — examples abound where “inner city schools” got donations and windfalls and still had subpar overall results — to level the playing field is a minimum starting point. Erase the funding discrepancy for primary and secondary education and then we’d be free to start working on other discrepancies. Come on. California is a bona fide global economy but we are FORTY FIRST in funding our students in this country? That is SHAMEFUL. 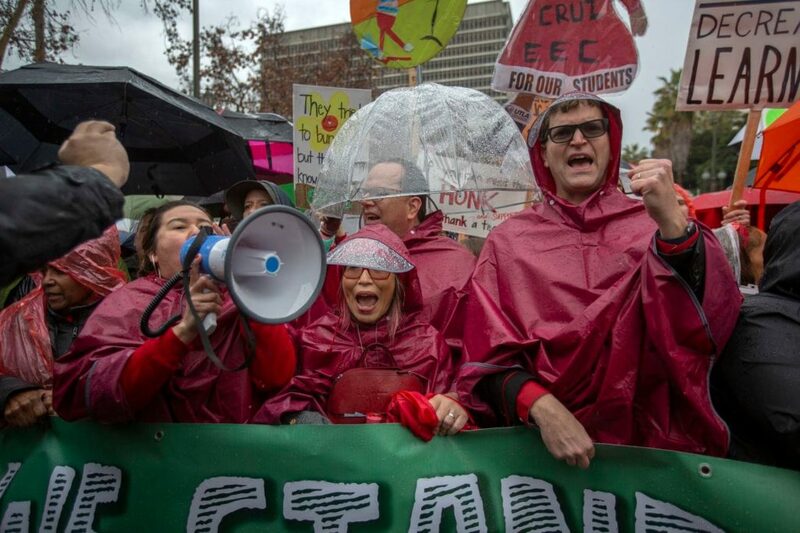 The “Red For Ed” movement was led by teachers — not unions — in a handful of red states who got sick and tired of salaries so low that many had to take second jobs. And they had grown weary of schools being starved of resources because of insufficient state and local funding. They went on strike in places where it is illegal for public servants to walk off their jobs. The Los Angeles strike is different. Teachers there are represented by their union, United Teachers Los Angeles, and the state permits strikes by public employees. California is controlled by Democrats in the governor’s office and the legislature, and is sometimes called the country’s most progressive state — at least when it comes to social issues. When it comes to education, not so much. California once had some of the most highly rated public school districts in the country. After the 1978 Proposition 13 property tax reduction law passed, spending per student plummeted, and things got worse in the recession a decade ago. Though spending vastly increased in recent years, California still spends less per pupil than the national average. In its June 2018 ranking of K-12 education spending, Education Week gave California an F for school financing. It was worse than the national average, which was a D-minus. So, I’m in with the teachers. Good luck, guys. If I had kids in the LA school system, I’d pull them out to support your strike. That changed in recent decades. As Democrats saw labor’s traditionally strong support weaken with changes in the economy, the party increasingly embraced market solutions to public problems. That was evident in its approach to overhauling public education: Among Democrats, support grew for operating schools as though they were businesses rather than civic institutions. Duncan, who became education secretary in 2009, used federal power to coerce states to embrace education policies that had previously been attached to Republicans, including the expansion of charter schools and the use of big data as key assessment tools for teachers, students and schools. Have you seen what charter schools are like? I have. No unions, overworked teachers, and no recourse. Zero oversight and zero regulation lead to lots of abuses. Many of the charter schools fail the children as well. (And guess what? Charter school teachers joined the strike as well. Iiiiiiiinteresting, as they say. Democrats don’t agree with one another on public education in the same ways they did decades ago. This entry was posted in Politics: California Edition and tagged budget, education. Bookmark the permalink.